The Tim Peake Space Descent VR experience opens next week on March 24 at The Science Museum. Planet Earth is blue, and in 5K UHD too, but is it worth the £7 entry fee? The Science Museum has partnered with Samsung Gear VR and VR storytellers Alchemy to recreate an astronaut's return to Earth from the International Space Station, in a Soyuz TMA-19M descent module. Tim Peake, Britain's first man in space, narrates the plunge. The Soyuz's design has barely changed since its introduction 50 years ago, so it's a bit like plunging 400km in a VW Camper van, at temperatures of around 1,500ºC. The experience involves you taking an extremely stylish seat, donning one of 20 Gear VR headsets containing a Galaxy S7, and putting on some headphones. Anyone who's used Gear VR will now that the field of view is a bit limited, but since this experience is recreating the sensation sitting in a severely confined space whilst wearing a helmet, that works quite well here. According to Alchemy founder Anthony Geffen, the experience was rendered in 5K for each eye, using, "over 100 computers." Obviously on the S7, that's down-ressed to something nearer full HD in each eye. The slight problem with Space Descent VR is that there's no force feedback of any kind – no controller juddering, and the seats, while undeniably stylish, are sadly lacking in a vibration facility. The nature of space travel, and particularly a re-entry in a Soyuz, is that it's rather cramped, and – as far as possible – safe. 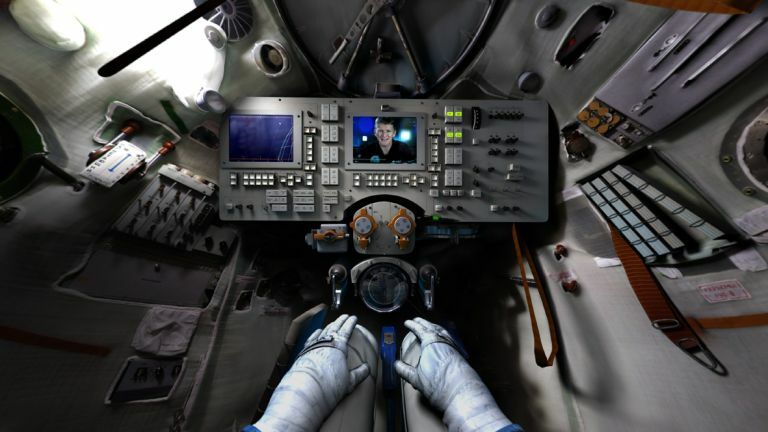 That means that sticking rigidly to VR's standard, first-person view would leave you with an experience that is essentially 12 minutes of staring at a dashboard and trying to peer out of the Soyuz's two, absolutely tiny windows. To avoid that, there are regular cutaways to a third-person view. This, of course, breaks the VR illusion of 'being there', but also gives you a much better feel for how vast Earth and space are, and how tiny and rickety a Soyuz module is. Overall, the experience is fun, technically impressive and worth including in a visit to the Science Museum. However, if you venture downstairs afterwards, you can see the actual TMA-19M that Major Peake returned to Earth in, alongside a pair of burly Russians. Take a look at its charred, ancient-looking exterior. Peer through the cutaway window that the Science Museum has installed into its horrifically cramped interior, lined with equipment like something from a 1950s telephone exchange. That, I reckon, gives you an even better insight into just how exhilarating and terrifying it must be to return to Mother Earth's bosom from the endless void of space. As you'd imagine, there are no plans to make Space Descent VR available via the Oculus Store, so you'll have to head to the Science Museum to experience it.